» Who do we serve? I have a small business. Will outsourced bookkeeping work for me? Yes. We work with several small businesses. As a matter of fact it is much easier to outsource bookkeeping when you are smaller. You can be assured that we give same level of care and attention to all our clients irrespective of their size. What is your approximate price for bookkeeping? Pricing depends on the nature of your work and the outsourcing model you want to choose. That is, if your work requires bookkeepers in the UK or bookkeeping staff from India. We have given the indicative prices on our price page. If you need an accurate quote, then just contact us. No. We clearly understand that outsourcing services are based on a mutually co-operative and successful engagement of both parties and so we believe in flexibility and so do not want to tie-in our clients with any binding long term contracts. We typically go in to 1 year agreement with 30 day cancellation notice. 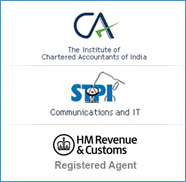 How can I communicate with your bookkeeper/accountant in India? You can communicate through instant chat, e-mail and SMS. Our accountants will be online most of UK time and so you can get to talk to them instantly. It is just like having a colleague at your own office. I own an accounting firm. I wish to outsource. But, how will you resolve any queries that you get on our client�s accounts? Will you talk to them direct? No. We will never ever talk to any of your clients. Our agreement will clearly mention this and we will never communicate direct with your client. You will be the only point of contact for us. Regarding the queries, we will make a list of questions and send it to you, and you can direct the questions to your client and get back the answers and forward it to us. What are the advantages of using your bookkeeping services? On an average we guarantee a 40-50% cost savings. Additionally there are so many other benefits like freeing up your valuable time and decreased overheads. How does the outsourced bookkeeping process work? You scan, fax or email the documents and send it over a secure network to us. We receive the same, acknowledge the receipt, complete the work, verify and send it back to your system with a job report. The process varies from client to client and please do call or email us to find how it can work for you. How safe is your document transfer system? Our document transfer system uses the same secure protocols used by banks and financial institutions for transferring their information like credit card information etc. How secure is your facilities? We are not computer experts. Will you provide technical help? Yes. We definitely will help you on setting up the process. So you never have to worry about lack of in-house technical staff. How will you make sure your outsourced bookkeeping service works right for us? Before we start to do anything we go through a standard operating procedure. We will first identify the areas that can be outsourced, do a pilot project on how it will be done, iron out all the potential problem areas and get a correct working process and get it going. It is not the end there, we continually look out for the possibility of improvisation and suggest the same to you and take it on from there. Fortunately our past experience has helped us establish the procedure already and so the time taken to set up this process is considerable less than usual. How can I start with you? Please leave your details here. We will get in touch with you and we could even get you started the same day. Outsourced Bookkeeping: How you can move from Pressure to Pleasure! Sometimes, pressure is not always associated with pain and suffering. If you are stressed out because of do-it-yourself bookkeeping and under a lot of pressure, let us find something to relax your muscles a bit, shall we? To do that, you have to quit bothering yourself with bookkeeping troubles and let someone else manage it. And in nice business lingo, we call that "outsourced bookkeeping"! Bookkeeping is a compulsory chore that every business should indulge in. But several small businesses struggle to stay sane, for managing bookkeeping activities and the core business affairs can drive anybody nuts. In that case, outsourcing is a feasible solution. It reduces costs, saves time and ensures that the data entered is accurate as it is being done by bookkeeping professionals. So what are the ways in which you can do this? What are the options available with outsourced bookkeeping? The different types of "business massage"!! In this method, you will be required to scan and send your source documents to the outsourcing company or upload them on their secure server. The bookkeeper there would update your books using the bookkeeping software such as QuickBooks, MyOB and so on. The updated records would again be uploaded on the server. You can download the books from the server when you so desire. This is a method by which the outsourcing company would arrange for its bookkeeper to gain remote access to your own computer. You would be required to scan and send your source documents or upload them on the secure server. The bookkeeper would connect to your computer using remote desktop access services such as Secure VPN. She/he would then perform the bookkeeping tasks. You can view the updated books on your own desktop. Online bookkeeping is simply the order of the day. The internet has simplified many things and bookkeeping is no exception. All you would have to do is scan and send your source documents and upload them on the server. The bookkeeper from the outsourcing company logs into your account and updates the books. You can check the updated records from anywhere, anytime. The advantage with online bookkeeping is that it is simple and allows access to accounts 24/7. Integra Global Solutions is a company that provides outsourced bookkeeping services to small and medium businesses. We have offices set up in the UK and USA and our operations centers are located in India so that you can get enjoy offshore services at low rates and at the same time acquire local support. So with us beside you, bookkeeping becomes a pleasure! Perhaps more heavenly than a having a body massage!